A good friend and I were talking recently about her amazement and sense of confusion around what exactly it is about Christmas gift-giving that causes people so much stress. In her mind, gift giving is about the intention to share happiness, and as soon as it moves into a zone of stress, it gets away from its original purpose. We probably don’t find ourselves ever saying “Wow, this spreading of joy and happiness is so stressing me out!” and yet that place of stress is where so many people end up at this time of year. In wanting to share happiness, we develop a sense that we don’t want to disappoint anyone. But I think our anxiety and stress comes from a place even deeper than that: we are afraid of being judged. We’re probably not truly worried that our Aunt is going to be sad because we bought her the wrong color blanket. We’re worried that our choice will cause her to think negatively of us in some way. We don’t want to be seen as not knowing someone well enough to pick a good gift. We don’t want to be seen as not caring enough to invest the time to pick something great. We don’t want to be seen as cheap. We don’t want to be seen as having bad taste. People want the gifts they give to make other people happy, yes, but underneath everything they also often want those gifts to help them solidify their relationship. 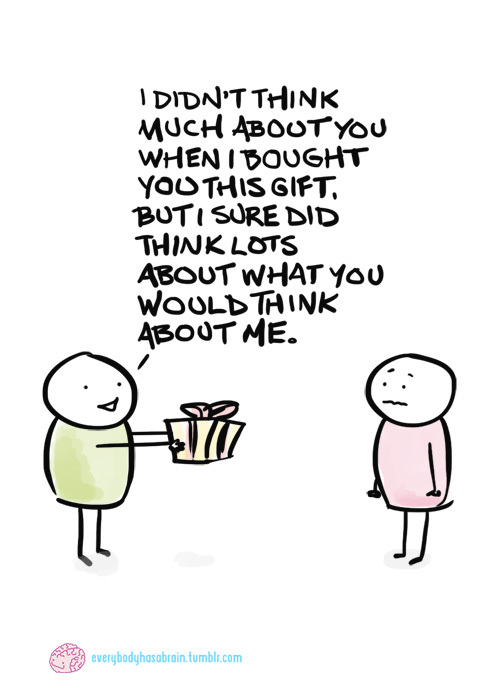 They want their gift improve the person’s view of them, not diminish it. It is about feeling that the process of gift-giving has strengthened and not weakened their desired social bond. But if gifts are things that are supposed to be given with no expected payment, then perhaps we should widen the definition of payment to include that social “payment” as well – a payment whose expectation drives us into that place of anxiety and stress. In the process of giving someone else a gift, we lose something if we deflate the lightness of joyful giving with a pinprick of expectation-driven anxiety. If you give with the intent of sharing joy and happiness then your work is done, whether you chose the wrong color blanket or not.